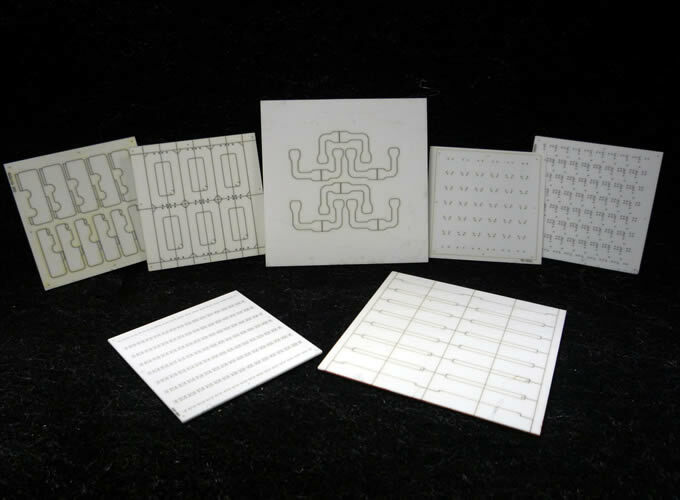 LEW Techniques’ in-house laser processing facility is available to undertake subcontract processing for the microelectronic and miniature fabrication industries. Using computer controlled Nd:YAG laser systems precise processing of a variety of materials and components can be readily achieved. Applications include precision micro-machining, drilling, cutting, scribe and snap, part marking, batch code serialisation and precision adjustment of integrated thin film or thick film resistors. Materials processed are chiefly electronic, microelectronic, telecom and space industry based, although any field using small parts will find our capabilities an invaluable source of precision work. Laser processing is often a faster, cheaper alternative to using more conventional methods of machining, due to minimal tooling and programming costs. Precision laser machining can be used for cutting intricate features on a miniature scale. Applications include separation of parts from finished substrates, manufacture of tooling, alignment jigs, insulating shims or spacers. 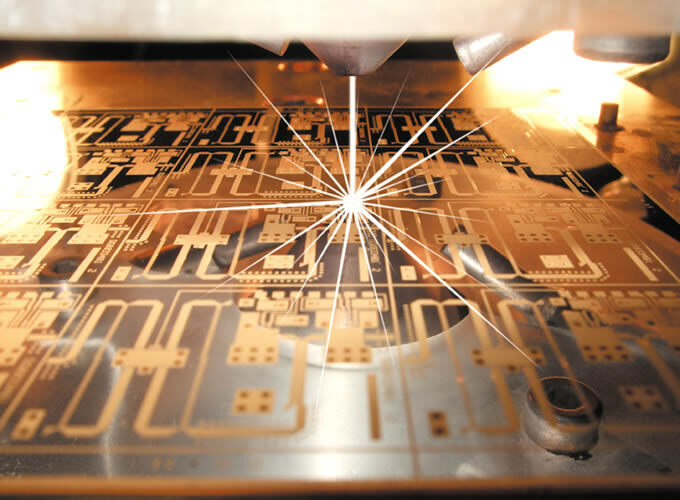 Our CNC laser systems enable simple patterns or very complex arrays to be programmed. Step and repeating maximises substrate material utilisation whilst minimising processing and set-up time. Depending on material properties, substrate thickness is in the range 0.125 mm – 1.5mm (0.005 in – 0.060 in). Maximum substrate dimensions 150 mm (6 in). Laser drilling produces holes that are clean and burr-free. Holes can be pre-drilled into a material at the beginning of the manufacturing process, or post-drilled into finished parts at the end of manufacture. Minimum hole diameter is largely dependent on the material type and thickness; a single point laser pulse will typically produce a 20 μm – 30 μm hole in a 0.125 mm substrate. Larger holes can be programmed as required. Laser scribe and snap can be used where finished part dimensions are not highly critical. As the name implies materials can be partially cut through and then subsequently cleaved to produce the finished parts. This process would be particularly suitable for volume production runs, as machine time is minimised lowering overall cost. Laser marking provides a permanent part mark, batch code or serial number identification to finished products, or sacrificial areas of a substrate. Marks can be applied at any stage of manufacture, facilitating process control, traceability or simply as product identification. Alphanumeric, special characters, bar codes and logos can be programmed. Minimum character height 0.1 mm. Laser cleaning and spot knocking are useful capabilities for changing the electrical function of a device, re-working part finished or finished items that would otherwise have been rendered unusable. Speed of design and development of products can be greatly increased when simple laser alterations to a product are made, instead of having the expense of re-tooling and re-making an item in order to prove a design. 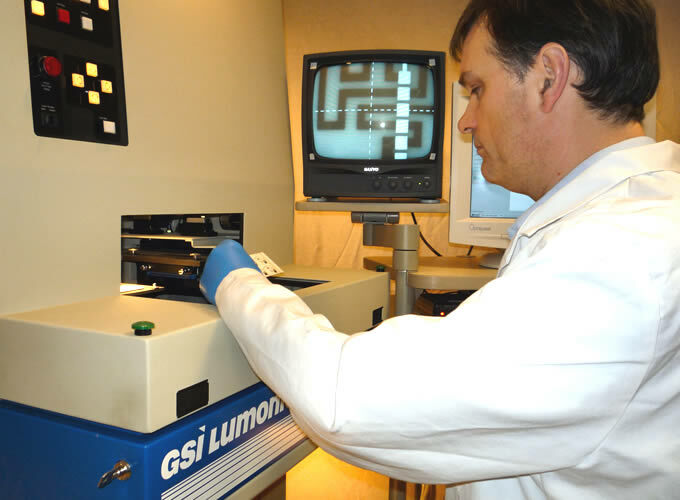 Our laser trimming systems provide us with the capability to accurately adjust the value of thin film resistors or thick film resistors. A single resistor to a multi-resistor, multi-image array can be efficiently processed using a fully programmable flying probe system. This makes it possible for us to offer a fast turnaround service to our customers. In conjunction with appropriate test equipment and interface fixturing, actively trimming electrical properties of thick film devices is also possible.